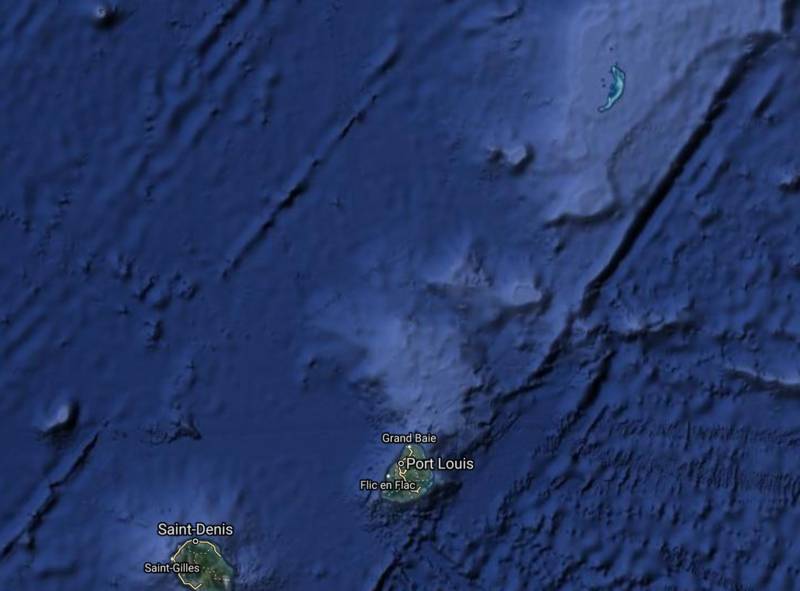 Great Soudan Bank is 110 nautical miles from Grand Baie, Sunset Boulevard. 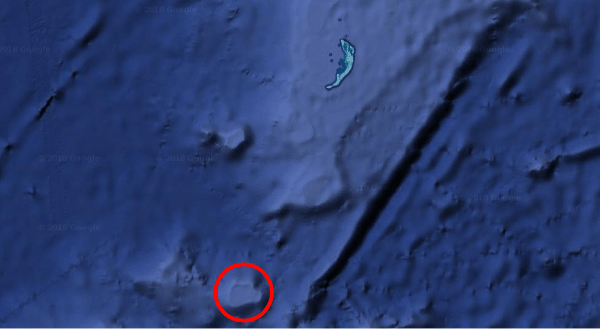 Small Soudan Bank otherwise known as ‘ti soudan’ by locals is 180 nautical miles from Grand Baie. Soudan Bank is a big plateau that is around 20 nautical miles in length and width with an average depth of about 60 meters. This unique underwater formation is famed for its fishing due to the unique aquaculture that thrives around it. 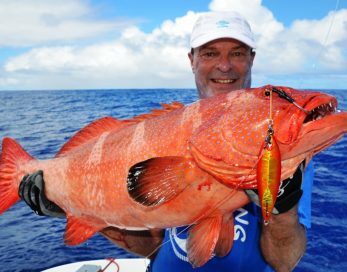 By following the relief of the sea mount it is possible to fish anywhere giving a wide variety of options depending on what the angler(s) would like to target. With a topography with a depth ranging from 3000 to 60 meters all sorts of fish are a possibility with the right lures and guidance. We strongly recommend making the most of our crew and discussing which fish you would like to catch. The Soudan Banks are a group of underwater high points and reefs off the coast of Africa, known for their good fishing yields as fishing banks. They are administered by Mauritius. The five banks (actually a single feature) lie on the Mascarene plateau. North Soudan contains large salmon stocks. South Soudan is the largest of the banks, with many reefs and passes. West Soudan is small, rocky, and shallow, and is the least fished of the banks. 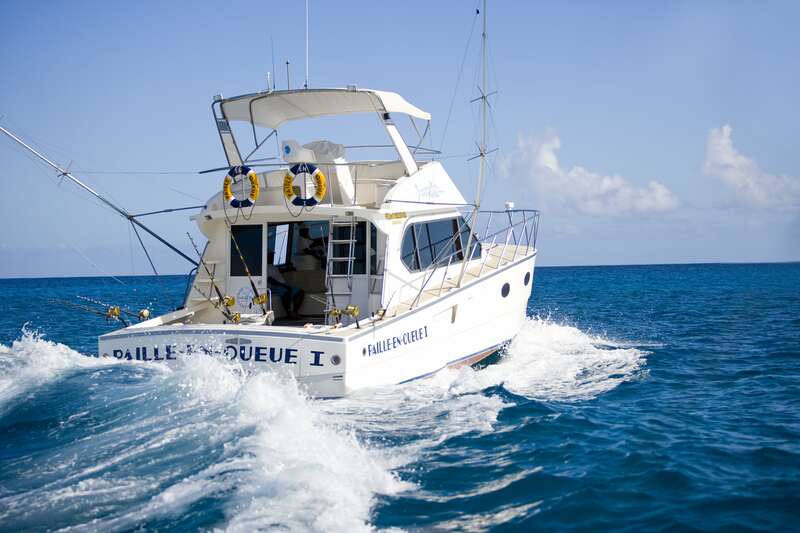 Central Soudan is the most fished area, with huge reefs and open waters containing a huge abundance of fish. East Soudan, until the 1970s, was considered to be a completely different formation altogether, since it is located more than 100 miles away from the other banks. The other banks are closely linked, separated by small shallows or channels. Two million years ago, Soudan was a large island, as were Nazareth, Cargados Carajos and Saya de Malha. 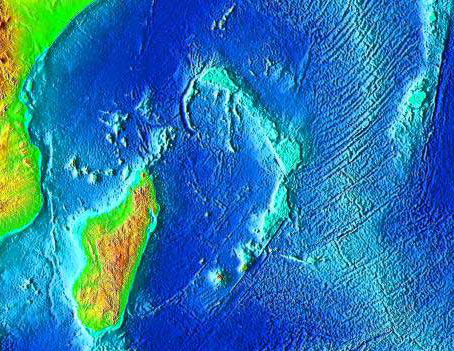 These islands were more than ten times the size of Mauritius and Reunion. However, they have submerged under the ocean. Having pioneered Big Game Fishing, Sportfisher is among the first chartered fishing companies to organise fishing trips to Soudan Bank. We have been organising trips for locals and tourists alike for XYZ years who regularly and often fly across the world for our fishing trips. Our clients choose us for our quality of equipment and expertise that Anglers hope to draw upon to land their dream catch. 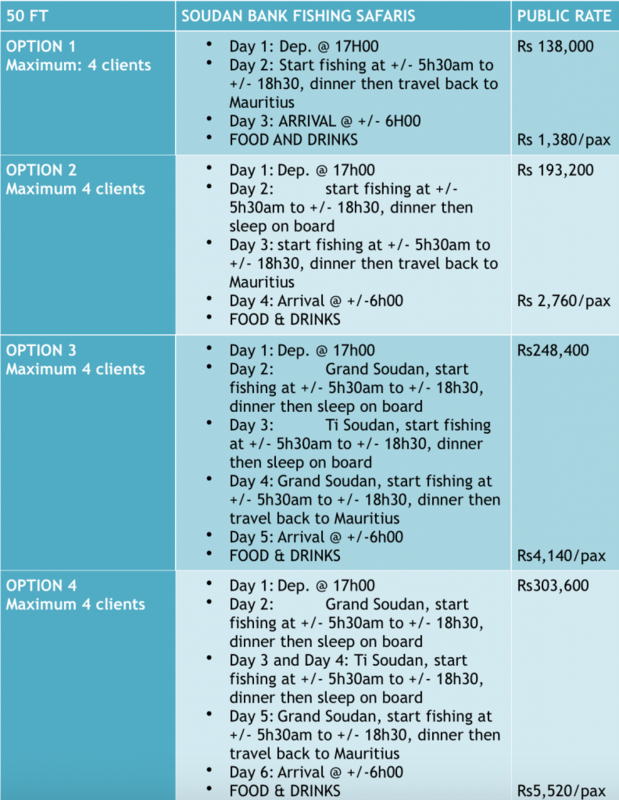 Due to the distance of Soudan Banks from Mauritius our various trip options range from 3 to 6 days, unless a specially tailored package is requested. Ours boats have enough space for up to 4 clients in order for us to maintain levels of comfort and luxury through fresh bed linen, towels, food and beverages. What kind of fish can I expect to catch during my Soudan Bank Trip? Setting sail at 5 in the afternoon, we will begin our 12 hour trip to reach Soudan Bank. Arriving at 5 in the morning the next day. We will begin fishing from sunrise to sunset. Depending on the Anglers choice we do a bit of trolling and jigging. On Trolling we target yellow fin tuna, Dogtooth Tuna, Skipjack Tuna, Wahoo, Dorado, Sailfish, Blue and Black marlin. While Jigging we target Dogtooth Tuna, Green Jobfish, Kingfish, Giant Trevally , Captaine, Yellow Tail Croissant (Yellow-edged lyre tail) and Vielle Babonne (Spotted Coral Grouper). 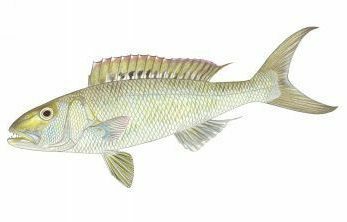 While various fish profiles can be found in our fishing guide here, we have attached a few profiles below of the unique fish expected and regularly caught around Soudan Bank. 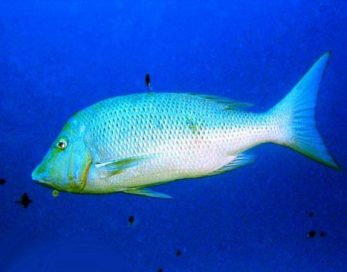 The green jobfish, Aprion virescens, is a species of snapper native to the Indian and Pacific Oceans from the African coast to the Hawaiian Islands. This species inhabits various reef environments at depths from near the surface to 180 ft (55 m). This species grows to a length of 112 cm (44 in), though most do not exceed 90 cm (35 in). The greatest reported weight for this species is 15.4 kg (34 lb). 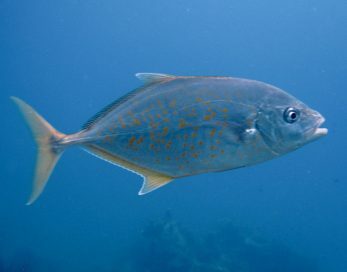 It is a very important species for local commercial fisheries and is popular as a game fish, though it has been reported to cause ciguatera poisoning. It can also be found in the aquarium trade. This species is the only known member of its genus. Pale greyish-green. Scale has a white or bluish spot. Three blue streaks radiate from the eye. Somewhat pointed snout. White or yellowish fins. Dorsal fin is fringed with orange-red. These fish are plentiful in Mauritius and well known for their delicious taste. Found near coral reefs over sandy bottoms. Adults grow up to 80 cm and tend to be solitary or swim about in small schools. This fish lay their eggs twice a year: at the beginning of Summer (October) and in Winter (mid-July). 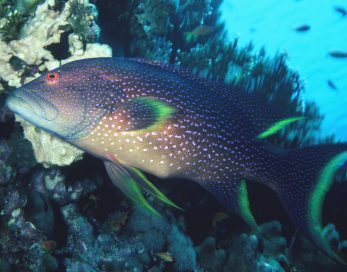 The yellow-edged lyretail (Variola louti) is a species of grouper, also known as the lyretail grouper or the caramel cod. The yellow-edged lyretail is found from the Red Sea to South Africa and the Pitcairn Islands, as far as southern Japan and Australia. This fish reaches up to 81 cm in length and 12 kg in weight. It is distinguished by its lunate tail with a yellow-edged margin. As juveniles they resemble the goatfishes Parupeneus forsskali or Parupeneus macronema and may shadow them as they feed. P. maculatus inhabits largely coastal and inshore reefs contrasting with other species of Plectropomus that are mainly associated with offshore and oceanic reefs. Turbid water and coastal habitats have resulted in relatively few abundance estimates. 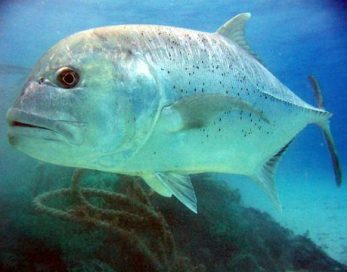 The depth of capture is typically from 5 to 50 m.
The Spotted Coral Grouper (Plectropomus maculatus) shall not be deemed to be toxic fish where it is less than 3 kilogrammes when ungutted or less than 2.6 kilogrammes when gutted and has been fished on any oceanic bank. The five banks (actually a single feature) lie on the Mascarene plateau. North Soudan contains large salmon stocks. The fishing here is slightly different from Great Soudan and makes a nice change of pace from the more popular Great Soudan Bank. The banks are interconnected via deep undersea channels which are best fished by using our latest fishing technology guided by our expert crew. A hundred miles south of Ti Soudan is Great Soudan Bank, the main attraction of passionate Anglers and Fishermen across the world. This unique underwater formation is teeming with life in a special aquatic ecosystem that breeds some of the largest record holding fish in the Indian Ocean. Knowing how to take advantage of this magical fishing spot and navigate through the underwater maze of channels and plateaus is what we have been doing for years. Its this priceless expertise that keeps our customers coming back over and over again hoping the recreate such blissful days while hoping to beat their last personal record. 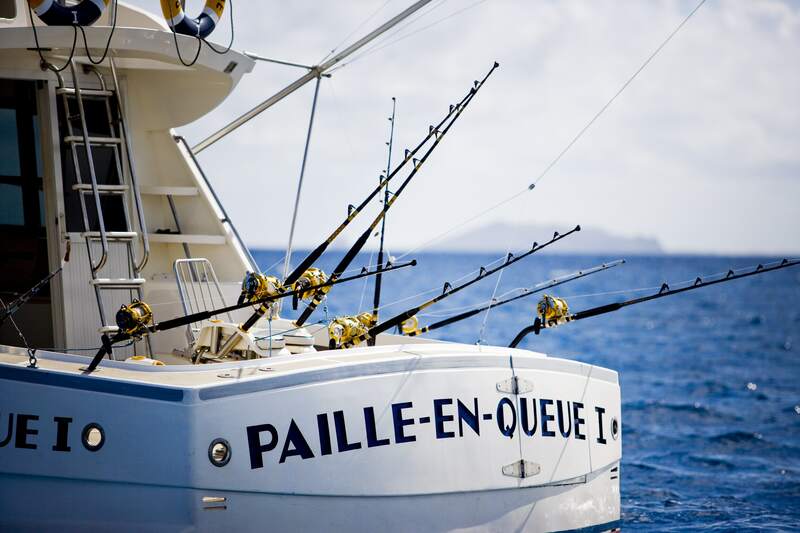 When it comes to the luxury on board our various Paille-En-Queue Vessels no compromises are made. All of our ships are specially custom made by family members who have been building boats in Mauritius for the past xyz years. Our custom model is often sought after by serious big game fishermen. The model is aptly called “D’Unienville” after the shared family name of the boat builders and Charter Company. 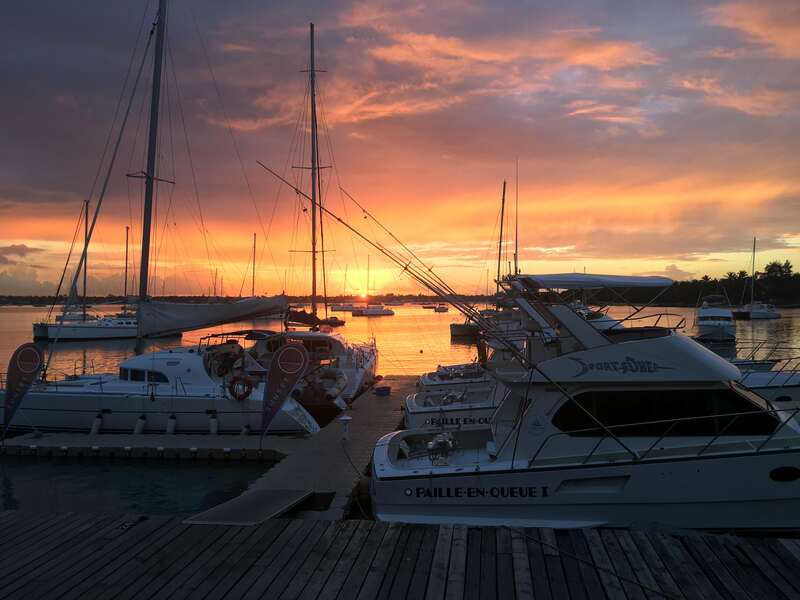 Our reputation in the fishing community in Mauritius is so well renowned that our style of custom boats are synonymous with our Charter Company which are often referred to as Sportfishers. 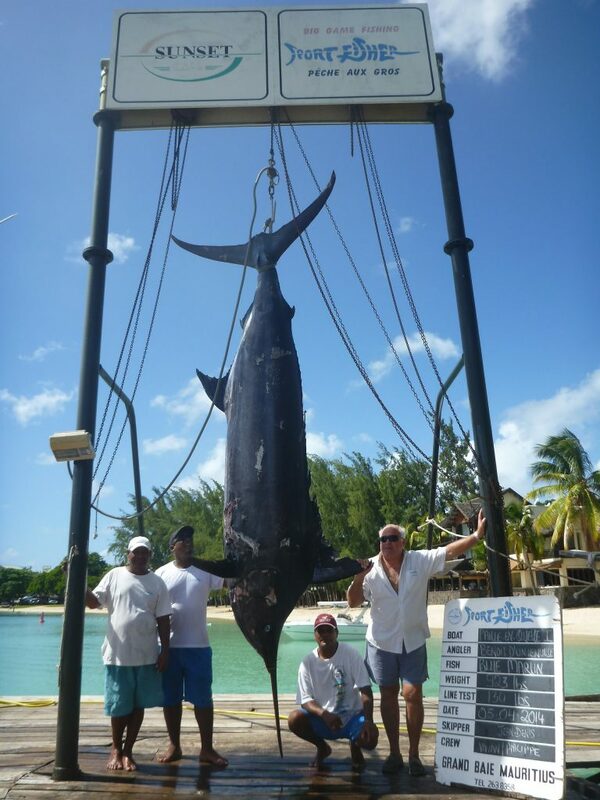 As one of the original pioneers in Big Game Fishing in Mauritius our quality of service and equipment is unparalleled, it is no wonder a majority of our clients are repeat customers who often fly in specially for fishing holidays with us and our crew hoping to beat their last haul or hook one of the legendary sized bill-fish the Indian Ocean is so well known for. – Shimano Tiagra rods and reels & Penn International rods and reels. – Lures, Koanas, Binoculars, Harnesses and Gaffs. – VHF Radios & Depth Sounders. 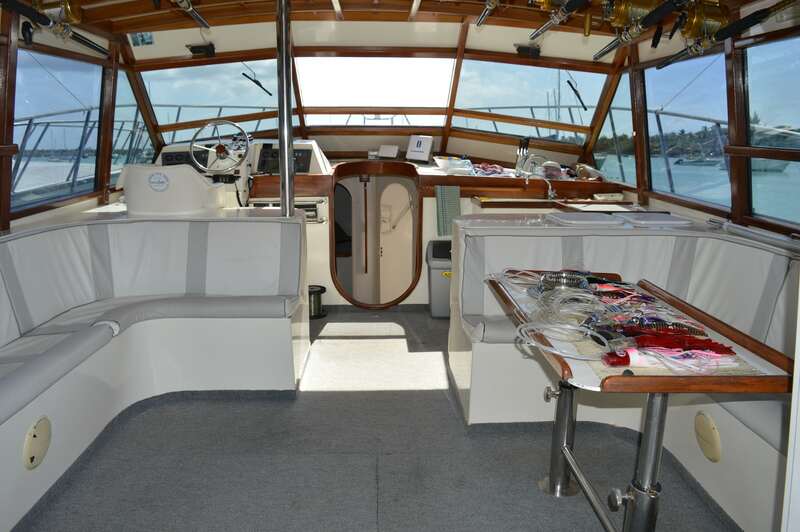 – AFT deck with 3 fighting chairs: 1 main & 2 auxiliary. Travelling to the various Soudan Banks can take anywhere from 12-15 hours depending on sea conditions. Naturally it is recommended to stay for longer than the minimum 3 days as more than 24 hours are usually spent on just travelling to and fro to the popular fishing spot. As avid fishermen we advise going for Option 2 or 3 as the extra 4th and 5th day give you an additional 1 or 2 days of solid fishing. It also allows you as Anglers to taste the difference between our two favourite spots of ‘Ti Soudan’ and ‘Great Soudan’. This allows you to try different fishing techniques and choose between the two spots for your second or third day of fishing, having tasted both fishing spots you will be able to make a choice based on which one you preferred or brought you more luck on the reel. Book a Fishing Safari at Soudan Bank!